It was a supposedly to be a light morning casual chit chat with Mawan but however the whole situation triggered Mawan to give an exclusive from his political heart to audie61. He talks about Saratok , Pakan and Political Expediency, Ministership ,Parties and New Voters trend in the country. Saratok delivered the Parliamentary Federal Government award as the best in the state in terms of assistance to the people out of the 31 Parliament seats in Sarawak. It was won in 2014 a year after he won the the parliamentary election in 2013. As an incumbent MP he worked tirelessly on the ground to see to their needs like an eager “First Timer in Parliament”. He was using his experience as a State YB which he garnered over 20 years and it proved to be succcessful. There is nothing to shout about it ,he said and he is only doing what the people wants and he delivers. There is an idiom which is,”if it ain’t broke,don’t fix it” PM and the Top BN leadership will only know too well. Mawan has proven to be reasonably successful and an effective assemblyman and he is from 2013 in Saratok till today proving also to be a well liked,well mannered and down to earth parliamentarian. His experience as a “State Assemblyman and Minister in dealing with all sorts of problems big or small and also led as a Party President in SPDP will not be discounted or overlooked by the Prime Minister,Chief Minister either. He said there are a number of PDP hopefuls in Subeng Mula,Basil Thomas and Dr.James Chella and they have been going around the constituency claiming to be the rightful candidate for BN in P205. Of course he knows that they are trying to impress the party and wanting the people to give them the mandate. They are also bearing down ‘some funds” for assistance in their own little way to sway the people. Mawan said as incumbent he has brought ‘government and parliamentary development funds” aplenty to the constituents and the people knows too well. PM Najib knows well enough what Mawan is capable of and the award is a living proof of Mawan’s “Rakyat Di Dahalukan” which is in line with the BN slogan. According to a special investigative report the aspirants or lobbyists are getting each others “THROATS” and this in itself is not healthy for Barisan Nasional for GE14. It will be a huge mess for BN to clean up as per the report which will tilt the balance away from the first timers,fence sitters,undecided voters. There is so much confusion on the ground and its a sticky situation and its not at all HEALTHY for BN in Saratok. Mawan wants this Imbroglio to stop as it will deteriorate further as a number of Supreme Council members in PDP are behind each of their hopeful and aspirant candidate (names withheld). Mawan himself as always preached the “Unity of Barisan Nasional”is of utmost importance as to regards to personal interest and grudges. Tiong himself seems to be ill advised on this matter and he needs to look at the bigger picture of Barisan Nasional and not to be misinformed ,misguided by some over enthusiastic party boys. Surely, Tiong doesn’t have his own Agenda besides for the better good of Barisan Nasional ? Mawan you are very much needed to win the seat for BN in Pakan. At that particular time when Mawan was summoned the former DCM Alfred Jabu and current DCM Douglas Uggah was also around says Mawan. Mawan has already made up his mind and he was push into it and “SACRIFICED FOR BN” by the late CM Adenan and PM Najib. It was last minute,last hour thing and it is not right for people to hearsay that he is SO GREEDY and wants both the State and Federal seats. This is very significant he says on the statement. Paul Igai in his statement said,”another reason Mawan should be dropped is that there is an understanding in Sarawak BN that no one should serve both as a parliamentarian as well as a state assemblyperson. He also cited Deputy Chief Minister Datuk Amar Douglas Uggah Embas’ recent statement that no one should hold both a parliamentary and state assembly seat. Why is that that many are not looking above and beyond the Unifying factor of BN instead are trying to find ways and means to put BN Politicians at loggerheads when the truth is not told said Mawan. These are his words,”I have already indicated to the late CM Adenan and PM Najid that I am willing to Sacrifice the state seat for Federal Seat in our meeting in Sri Perdana and it was Political Expediency that I was chosen as a BN Direct Candidate . I have secured the seat for BN in Pakan even though the margin was small of 426 and its still a BN win. An independant Jawie Jingot @ Jenggot received 3573 as compared to Mawan 3999. Tiong in a press statement of PDP did say this,”BN deliver all seats provided that all the BN component parties cooperate among ourselves and not sabotage each other.” Mawan have not sabotage anyone and he is not about to start doing that and he knows how BN values his loyalty. Mawan said if a solution is to be found for this “imbroglio of Saratok” he is now ever ready to RELINQUISHED the Pakan seat for the better good of the unity within Barisan Nasional. Of course, its up the Chief Minister Abang Johari and the State Barisan Nasional hierarchy whether i should bring this chapter to a close . PM Najib knows what Mawan wants and he values BN loyalty and a win for BN for Saratok in the upcoming GE14. Will Tiong be rubbing his fingers to have the State seat of Pakan back as a PDP seat? That is for deliberation by the State BN and Mawan says as long as the State seat belongs to BN even if there is a by election called he is all supportive for a BN appointed candidate. President Tiong will have a Vertigo if after Mawan relinquishes it will still be at square1. Who will claim this seat is anyone’s guess.? I did not go back on my words that I am going to serve as a FULL STATE MINISTER in CM Adenan’s cabinet. I could have chosen the easy way out and be taken in any component party of BN or be picked as a Minister which is the prerogative of the Chief Minister in naming his cabinet. Instead after Sri Perdana Meeting he has already made up his mind and as a Promise to the PM Najib and to CM Adenan to concentrate on his Federal duties. Its of no use saying that I have been dropped and “party less” which is a very feeble excuse to gain political mileage by some political opponents but the truth always prevailed says Mawan. There are many businessman, individuals and groups of people who want to join certain parties but due to mistrust,infighting and petty politiking are opting out of Political parties and are non aligned to anyone. Mawan said that this trend is developing and it will tilt the voters mindset as they will vote the ‘choice of BN direct candidate” PM Najib would not only want to win for BN but also to secure a 2/3rds majority to have a stable and secure government for the good of the country. The late CM Adenan knows that Mawan’s experience in the state after serving as a Minister will want Mawan to be a good Federal parliamentarian who will not only be good for Sarawak but also beneficial for Malaysia as a whole. 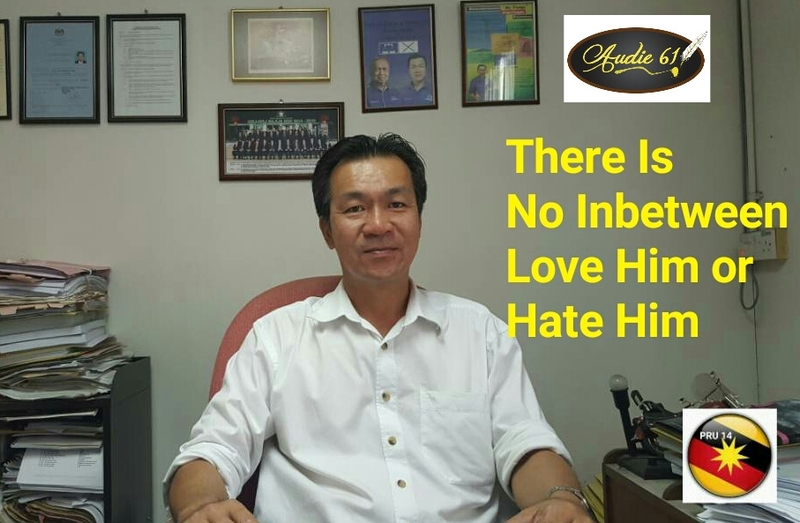 audie61 says,”The whole Imbroglio in Saratok and to a certain extend Pakan have been told as per this interview and Mawan will not hesitate to RELINQUISH his Pakan seat if that is the wish of the BN hierarchy and he will certainly abide by the BN rules as set down. Of course at the end of the day, Mawan will listen to only the advise put forward by the top BN leadership in CM Abang Jo and PM Najib . It was a fruitful conclusive interview by Mawan and he sticks with his decision.BN will decide and he will toe the line. In his first foray into the “elections world” in 2016 he stood on BN/SUPP ticket in the Kota Sentosa Seat against the “mighty” DAP Sarawak Chairman Chong Chieng Jen. The result as many have predicted that he would not stand a chance. The ground talk ,”Sacrificial lamb plus no wants loves him.” Is that so? Many Kota Sentosa constituents are now regretting it by not putting him in as their “Voice” in the State assembly. Wilfred Yap is very menacing when you are first introduced to him. He is a six footer,walks very fast, his handshakes are firm plus his voice is not EXACTLY SOFT. Many though would crave for his voice especially those in politics. He would have won a long time ago if he was a “DAP Candidate” during SUPP turbulent years. If he had taken a bite of the DAP’s cherry. Many young leaders left for greener pastures or retire early as they could not take the “losses” to once a strong party. He stood firm with the party and today he has been appointed as ” Public Complaints Bureau Chief” and also a Councillor of Padawan Council. He has been working or as they say “turun padang” and criss crossing the constituency of Stampin. The President of the party Yb Dr.Professor Sim knows Wilfreds Potential and knows that the “people of Stampin constituency” will take him in as “their Stampin voice and adopted son” in Parliament for GE14. Wilfred said on his walkabout,”its really a good feeling now that people are coming up to him,shaking his hands,tapping his shoulders and giving him encouragement for the Stampin Parliament Seat.” Previously in his first foray in the State elections he was all “gungho”to fight DAP but there wasnt the genuine warmth and sincerity from the people then unlike now when he is weekly attending to their needs. The SPCB “Supp Public Complaints Bureau” seat has indeed been a blessing as this service is 24/7 and he is attending to all the needs of the people who ask for help or assistance. The “Hate”syndrome of this young lawyer is finally been tested to the fullest. He is seen daily in the media and in the social media world. There is no escape from the watchful hawks eye and it will very political disaster if he fails to deliver on his words. His earlier involvement in an NGO Jaycees International which has “service to humanity is the best work of life” is being realized. The President of the party Yb.Dr.Professor Sim knows that Wilfred will come good and to win over the Constituents he will have to put Wilfred through the “mill” with the most stringent test. Of course when the road is already been build it will be easy for many in the party to want to be the party’s candidate too. Wilfred sees that “factional infighting or mere sabotaging” on his candidacy will be very incessant. He believes in his party that SUPP that they will make the right choice and will support whatever decision the top leadership makes. Meanwhile he will continue to serve for the better good of the constituency and will reach out to all Sarawakians whatever race,religion,colour,culture or background. The opposition will not only hear him now but if he is blessed with the Stampin Candidacy and elected he will not let the people and his party down. He knows too well the feeling of defeat after his first outing and he will not want to let the BN Chairman PM Najib Razak, State Chairman CM Abang Johari,President of SUPP Yb Dr.Professor Sim and his party go through the process of anguish and defeat. This time,he wants to do it more for the people of Stampin Constituency and let them be assured that they put the right man there. The Stampin Parliamentary seat is a very “winnable seat” for Wilfred as he has his trump cards up his sleeves. The BN Strategic and election support team needs not look further than Wilfred and need to give him their “Fullest Support” to make it a resounding victory for BN and SUPP. Wilfred was grilled and attacked mercilessly and directly from audie51 team and he felt the full brunt of our force. His Party President, his party comrades plus those who sees his overall potential knows best. He is menacing yet very passionate towards his work for the people. We need not look further than what we have in store for the us. We need peace,stability and a strong government which will ensure that all races in Malaysia live side by side in harmony together. Joseph Salang Deputy Minister of Information Communication and Culture addressed the multimedia participants that there must not be any compromise for Peace and Stability which will be a dampener for the future of our nation as it looks forward to 2020 and beyond. THE TRUTH MUST BE TOLD AND LIES MUSTS BE CHECKED. We have heard of the Andy Williams song”You’re too good to be true” but if we are e lovers THAT”S O.K, but one of the lyrics that really gets me..Oh pretty baby, don’t bring me down I pray…. IS IT ALL SO NICE AND AS THE PICTURE SHOWS? PERCEPTION PLAYS A VERY BIG PICTURE IN POLITICS AND SOCIAL MEDIA PLAYS A VERY BIG ROLE IN DETERMINING THE FATE OF POLITICAL WANNABEES. 100 % Behind are all but just mere words when actions/words are unfulfilled and it happens once too often and the silent majority are now fighting back in a way which will determine the outcome of politicians who are true to their words or justs paying lip services. BN OR PAKATAN needs the peoples representatives who can work for the country instead of justs promising the world i.e (I will give this,that,and that) to the people and many wannabees will very soon know their true values…. IT WILL BE A LITTLE TOO LATE AS THE DAMAGE WAS ALREADY SELF-IGNITED..
Today’s world and technological advances and computer savvy voters have turned to the internet,blogs,twitters,stumbleupon,Linkedin and the mosts used social media tool is FACEBOOK. Are you hooked up to any of them? Everyone is able to access especially with the Information and Culture Ministry trying to get the rural areas connected and to stop the Opposition harping on inaccessibilty of the NEW MEDIA. The MCMC are tasked to work out the rural digital divide and make Malaysia more progressive as it forges closely to achiving a fully developed status by 2020. The cyberwar is being fought fiercely between Pro BN and Pro Pakatan troopers and they will try to outdo each other by getting their messages across. Without a doubt this is also used as a tool to try to defame,character assasinate and spread malicious lies and hopes that they trickle down to the grassroots to secure VOTES. Its up to the cyber troopers,bloggers,facebookers of both Pro Coalitions to defend and tell the whole truth and nothing but the truth. UMB has been set up as a solid, strategically monitored, defensive and tactical unit to combat the political parties from LIES and UNTRUTHS. It has become a much neede machinery for politicians from both political divides to use and to try to paint the wrongs to RIGHTS. Politicians without the UMBs or any socialmedia units will stand more to loose than to Gain. Its becoming to be an ASSET to blockade FALSE PROPAGANDA and to push the much needed messages of the political parties across. You musts know the “surat layangs’ of yesteryears and how effective they became. DID YOU WRITE ONE TO TELL SOMEONE OF THEIR MISDEEDS…??? UMB telah menjadi sebutan di persidangan UMNO yang baru saja berlangsung minggu lepas. UMB di bawah naungan Tun Faisal Exco Pergerakan Pemuda UMNO Malaysia juga kian menunjukkan kehebatan mereka dengan kehadiran blogger yang berwibawa dan berkaliber. Dengan penyampaian berita dan info terkini amat membantu kemenangan BN. Ianya bukan hanya perkara remeh. Bagi sesetengan orang UMB tidak diperlukan kewujudan mereka. Namun di persidangan UMNO yang lepas malah PM kita juga menyebut akan kepentingan UMB di era ini. Unit Media Baru medan perang di era ini yang mampu menggegarkan pihak pakatan. Jangan pandang rendah pada UMB. Janji UMB akan memperjuangkan hak rakyat dan BN. Jangan ambil remeh akan kewujudan UMB. 111111..What Changed in your Life..?? Numbers are very significant in our lives. We were born at what time,what date and what year. There is no such thing as someone telling you ,”I don’t believe in numerology.”Do you believe that the person next to you now is watching your every move. He is looking at his watch determining and taking notes of what he has seen and jotting it down. As for the couples it was a very busy day for mosts of them who has taken the significant steps of saying,”I DO” to each other. We at audie61 wished them all the bests and may they live a very fulfilling lives together for better or worse,in sickness and in health and for all the good times and in bad all throughout their married life. Some may cherish this moment 111111 all through their human life while some sad to say will fall apart. The winter solstice of 21-12-2012 marks the end of the Mayan Long Count cycle. This occurs at 11:11 universal time. This fact opened a Pandora’s box of interesting new 2012 linked data. Some years ago amidst my explorations of occult subjects I discovered the cult of interest surrounding the specific time 11:11. This movement came about due to peoples peculiar experiences with that time or with the number 1111. Generally speaking this was a matter of synchronicity or meaningful coincidence. The 11:11 phenomena’s participants would find that most days they would happen to look at a clock at exactly 11:11 or perhaps 23:11. Some tried to explain why this was happening. The most popular explanation was that a group of higher being, or angels, were using it to bring themselves into human awareness. This explanation became very popular and spawned numerous groups and books. This interpretation of 11:11 phenomena is however not of great interest to most 2012 researchers like myself. The number 11 in both singular and duplicated form has great importance for 2012 related astrology, prophecy, numerology and history. Lets just start by making everyone aware that if we take the Mayan symbol for 11 and then duplicate it, flip its duplicate, shift them both ninety degrees, we have the image of 11:11. Of course 11 has its own numerological meanings. One numerological interpretation is that it marks the beginning of new cycles, increased spiritual leanings and compassion. It is considered as one of the master numbers, those few that are not reduced by the addition of the constituent numbers. This number and specifically the time 11:11 being so linked to the December 2012 event has stunned many of those experiencing these temporal synchronicity events. Indeed it has shocked some of the supernatural and occult subject researchers who had long begun to ignore the phenomenon, myself included. I have myself experienced many 11:11 temporal synchronicity events. Additionally I have 1:1 in my birth-date, which on an intuitive level always felt some-how important to my life quest. It was the synchronicity of separate personal contacts having sent me 11:11 related data within hours of one another that brought this subject up again actually. Logging into a 2012 site in which to post a follow up I found myself on post number 1111 of the web thread! An important element of the 21-12-2012 subject is the contemplation of Solar dynamics and Solar behaviour. I am no Heliophysicist or particle physicist so will rarely brave explaining any magnetospheric dynamics in relation to 2012. Even respected ‘experts’ on the science behind the workings of our nearest star admit that they do not have complete models. New understandings are constantly being reached in this area of astrophysics. There is no doubt that the Sun’s erratic behaviour has massive effects on Earth’s biosphere. We sometimes forget that we do not merely orbit the sun but rather reside deep within its magnetosphere, the invisible part of the sun that extends out as a spherical bubble enclosing the inner planets. Many experts have contended that changes in atmospheric ion count for example can effect human and animal behaviour, as well as our bio-clocks. Thus influencing biological, physiological and behavioural patterns of all living things. Certainly we know that some frequencies of radiation from the sun can effect cell division or brain functions. Excess or lack of certain frequencies and types of solar radiation have been observed to give radical effects on human beings under laboratory conditions. The reason why the Sun becomes important in the 11:11 subject is not simply the solstice point in our calendar. It also happens to be that the sun’s magnetic field operates a cycle of polarity reversals averaging 11.11 years in length. The next peak of this cycle happens to be in the year 2012 and has been predicted by some astrophysicists to likely be a very active maximum. Some posit possibly the most active since the end of the last ice-age. There are also important 11 year cycles in human population growth in respect of birth rates. Even more incredible is the finding that the entire mass of the black hole central to our galaxy spins once every 11 minutes. Nikola Tesla, the unsung hero of science whom gave us such wonders as alternating current (imagine not having that! ), was very interested in the Sun. Although a hard scientist he was also rather superstitious about numbers, and held the perhaps strange belief that the Sun and the Earth were dynamic living organisms. A belief held by many indigenous peoples of the America’s. I mention this because on some level I am left wondering if the Sun is either consciously or by unknown natural mechanisms communicating with the life forms that inhabit its sphere of influence. Is the Sun, our temporal governor, speaking to us through the very devices that display its movement through the divisions of the day. Could this really be like the elephant in the living room that nobody wants to see. The sun having an 11.11 year cycle, the winter solstice of 2012 falling at 11:11 and people all over the world finding themselves bombarded with 11’s just as science is predicting some kind of majestic solar event at the peak of this current cycle seems more than coincidence. One rather dire possible event is the Earth being hit by a massive Solar event such as the November 2003 monster X-ray flare that erupted from the Sun. This was the most powerful solar flare ever recorded at X-28. It blinded the NOAA GOES satellite for 11 minutes. There is even a cosmic 11-11 mystery. Two comets called 34D/Gale and Boethin, have mysteriously vanished. Both of these were 11 year period objects! Interestingly 11’s have played important roles in recent history. The 11th minute of the 11th hour of the 11th day is the official moment of remembrancefor the lives lost during, and cessation of, the terrible fighting in Europe during WWI. Two minutes of silence are observed, a pair of 1’s yet again. More recently we have the initiation of a war on September 11-01, which may yet be remembered as the start of WWIII. It also transpires that 111 in numerology is a ‘power number’ related to fresh modes of thinking applied to new cycles in life‘s play. It is of additional note that not only did we have the start of the war-on-terror on the 11th September, but that it was heralded by the destruction of the two great world trade centre buildings appearing to stand above the New York skyline in the form of an enormous 11.The 1st plane that impacted was flight 11 with 11 crew on board. An aspect of 9-11 not mentioned much is that card number 16 of the classical Tarot portrays a tower struck and crumbling away with people falling. The card appears in Tarot spreads as an indicator of massive tumultuous and painful changes before something new can appear. It was as though the symbol for massive turbulent changes just leap off our Tarot card and onto our TV screens. As a 21-12-2012 subject matter researcher, it would be perhaps ironic if I had missed the timing of the event in relation to that subject. The events of that fateful day occurred just over 11 years from the end of the Mayan calendar. Was this a vast cosmic herald of great change relating to the numbers 11, 111, 11-11? Its also interesting to note that the very numbers of the solstice date 21 12 2012 combined give us the number 11 once again. Almost like a fail safe, just in case we were too dumb to notice all the other 11 related patterns! One fun mathematical oddity is the fact that 1111 multiplied by 1111 gives us 1234321. This forms two sides of a structure like a small Maya stepped pyramid in numeric form. In terms of the much vaunted ‘New Age’ and the coming of the era of Aquarius it is notable that the water bearer is the 11th sign of the zodiac cycle. Interestingly 1111 days before the 2012 solstice is the date 6-12-09. The fact that 6, 9, & 12 are sequential multiples of perhaps the most highly regarded spiritual number 3 is a notable fact. For my part 3, 33, 333 & 3:33 have been the numbers that follow me through my life more than any others in relation to synchronicity. The 11 link returns when we divide 33 by 3 which of course give us 11 once again. Also don’t forget that the date 9-11 can be seen in numerology as 333-11. Another notable date is of course 11-11-11 which may well present some interesting suprise for our planet. I have noted that on previous dates such as 10-10-10, 09-09-09 etc. important events have happened. I will be writing more on this in a seperate article nearer the time to include both my actions and expectations for that date. Perhaps the most powerful lesson inherent in the number 11, is that there is one, and next to it there is one. I am another yourself, and you are another myself. Each is one. All are one. There is only one or lak’ech as the Maya say. If only all mankind could find in that a simple positive message.